JK Front Inner Fender Kit Solid for Jeep Wrangler JK 2007-2016. When installing a pair of Poison Spyder Crusher Flares on your JK, you have the choice of either trimming and reinstalling the Stock plastic inner fendersor going with something much better looking and commensurate with the quality Crusher Flares you just installed. Poison Spyder JK Inner Fenders dress up the look of your front wheel wells with beautiful CNC laser cut, bead-rolled and brake-formed aluminum. The perfect complement to Poison Spyder Crusher Flares, other aftermarket JK flares or even the Stock flares! Poison Spyder JK Inner Fenders are the best looking, easiest-to-install metal replacement JK inner fenders on the market! They are a one-piece design, meaning you do Not have to bolt them together as you are trying to put them in, and the finished install looks clean and uncluttered. 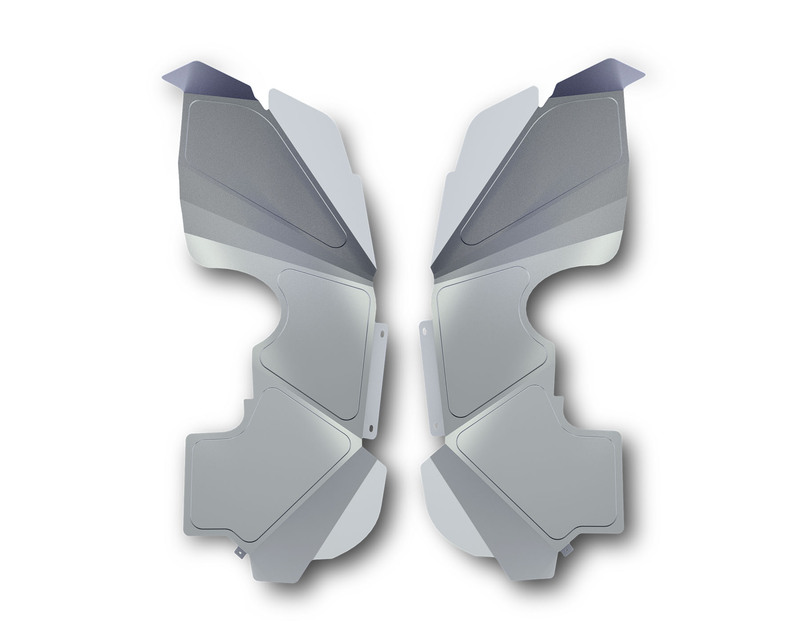 Made of 16 gauge 5052 aluminum, these Inner Fenders are lightweight, strong and look great. The bead-rolled panels look great with a motorsports flare, but the beads actually help stiffen the product for further strength. They Not only look great with Poison Spyder Crusher Flares, they are also a great addition to any Jeep JK Wrangler, whether it still has the Stock flares, aftermarket plastic flares or other manufacturers metal flares. But of course, we do think they look best with Poison Spyder hand-built, roll-form-tubed JK Crusher Flares!